We just watched Forbidden Kingdom and really enjoyed it. Really fun sort of Kung Fu Wizard of Oz. Worth a watch especially if you have kids about, they were all over it. I've watched 5 or so episodes of Gotham and it isn't really a Batman show. Sure it leads into Bruce Wayne becoming Batman but it is really more of a Jim Gordan show. Kind of showing the slow burn that is leading up to why Gotham needs someone like Batman but from Gordan's ground level perspective. I'm still pissed that the US didn't get Return to OZ on the 18th, as other regions did. @TriforceBun Yeah so finished the second season... definitely gets even better. I really feel like, despite being one of these sort of, for lack of a better way to describe it, "chaotic comedies", it manages to find some real grounding when it gets into certain topics like adult relationships and such as well. Some really powerful moments. Was not expecting that based on early first season stuff. The Shield as well is already one of the best shows I've seen and I'm starting the 5th season of 7. It's as good if not better than Breaking Bad, and I'm a Breaking Bad fanatic. PSS. This thread reminds me of the movie thread. Anybody been watching Aziz Ansari's Master of None? It's a fairly "smart" comedy that tackles a lot of big issues in some pretty progressive ways. It's not perfect (for instance, some of the acting seems very stilted at times, especially his TV parents who are played by his actual, non-actor parents) but we're enjoying it. Oh and there was a lot of breaking the 4th wall which isn't necessarily bad but at one point it was done to parody its own sincerity and like come on... either be sincere or don't! Oh yeah, Lori Loughlin! Always nice to see her. She's in her 50s now...but honestly? I wouldn't know it by looking at her. She...she still looks good. Seeing her in the 2008 "reboot" of '90210' was a surprise treat when I sat down and watched that with my wife. As for the show, a buddy of mine was telling me about how they broke the fourth wall a lot. Especially during one such time, which was a reference to the Olsen twins and why their old character wasn't on the show. I haven't seen 'Fuller House' and I can't count myself as one that was a fan of the original, but hearing about that specific joke actually kind of made me want to see it. @GameDadGrant Yeah they made some comment about how Michelle was too busy to come visit and then they all stare directly at the camera for like 5 seconds straight. I dunno, I'm into the more uh... natural look? If you haven't watched or started watching this new show yet, please do so at your earliest convenience. That is all. My girlfriend started without me, though I didn't know why I should. What makes it so great? Smart girl. She's a keeper. Well, not for starting without you, but for not waiting to dive in. What makes it so great? The question is, what doesn't? The acting is nearly spot on (Winona Ryder and David Harbour are fantastic), the music is amazing (like, totally), the directing and camera work are well done, the 80s vibe is super rad, the story is interesting and feels fresh, and, I mean, even the design of the series name is awesome! The series creates a sense of tension from the start, and keeps one intrigued through a compelling desire for resolution. It has heart, and it seems to beat for all involved. There are a few cringe worthy moments, but just look past them, and let the experience envelope you. It's a glorious one. A series like this doesn't come along often. One that has so many genres mixed into one. Very few, as well, feature both kids and adults in a seriously compelling way. The kids are fantastic, seriously fantastic. Sure, the roles are generically typical, but it works. It's as if you're watching three versions of the story at once. The adults, the kids, and teenagers. Brilliant stuff. I've heard it has a Spielberg vibe to it, sort of like what Super 8 was going for, but even better. (I liked Super 8 quite a bit, though) I may just have to check this out. Super 8 came to my mind when watching it. As did E.T., so I can get the Spielberg vibe you mention. However, Stranger Things is truly its own, and stands firmly as such. It is very rare for me to rewatch something, especially so soon after watching it. But, I want to. I watched it on the smaller TV in my bedroom, but I want to watch it again on the bigger screen with the sound system cranked up. This show is cinematic in every way. It's a marvelous gem through and through. It's really good. It does remind me of Super 8 in the sense that it'd almost be a kid-friendly show if not for all of the messed up stuff happening and very adult violence (it also has some adult sexual elements, which Super 8 didn't really have.) But it's basically this weird drama sort of centered around kids (though it jumps between who it is centering on a lot with a pretty large cast... kids, adults, teens, reminds me of Twin Peaks in the sense that it has so many different people it jumps between centering on) which involves some weird creepy stuff going on and missing children and yada yada. My only real complaint is it seems to be showing a lot of its cards early on. As opposed to Twin Peaks where 90% of the time you're like WTF IS GOING ON?! here it's like we kind of already know the main players and this and that 4 episodes in, it introduces a lot of BIZARRE stuff but then you get some kind of half explanation soon after for most of it, so it's just a matter of getting to the root of it. Unless they start throwing even more twists into it, which they probably will. Okay, I'm convinced! The next chance I get to relax in front of the tv with the wife, I'll give this sucker a go. Hopefully sooner than later. I'll post impressions as they happen. I'm jealous! You get to experience this for the first time. I wish I could scrub my brain clean of it and watch it again. Enjoy... as if you'll have a choice. Just be sure to pump up the volume for the full shebang. 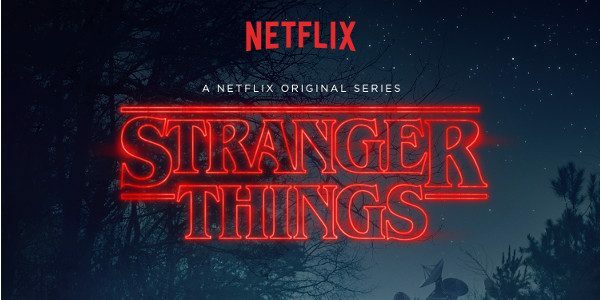 I wasn't honestly expecting to yet, but I managed to watch the first 3 episodes of Stranger Things. Gotta say, it is pretty darn good! I may not quite like it as much as you yet, @NoName, but there is plenty to enjoy. -The kids are all great, though I question a few of the reactions here and there. -Hints of E.T., Poltergeist, and a few other 80s staples. Felt more homage than theft, which is a good thing. -Why did they kill Benny? I liked him a bunch. Only 5 episodes to go. Shouldn't take terribly long to finish. Great recommendation!